In the Priceline Free Beauty Bag that I got earlier in the month, there was a $10 voucher off any CoverGirl purchase. I went to Priceline on Monday and used my voucher to get a CoverGirl Lipstick. 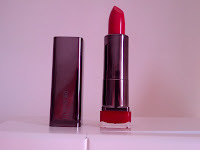 I chose a red lipstick called Hot Passion(305). It's apart of their "Runway Shades" from Pat McGrath who is a fantastic make up artist. The lipsticks in this range contain a silk moisturising complex that helps to maintain moisture and keep lips looking beautiful. There are 7 shades available in Australia (but 16 in the US). I have a love/hate relationship with red lips. I LOVE them, but find them difficult to pull off. I think it's mostly because red lips command attention, and I'm more of a wallflower. But I decided to go out of my comfort zone, and embrace the bold lip. I haven't used a CoverGirl lipstick before, and found the consistency to be really soft and creamy. I'm much more of a gloss girl than lipstick, so I'm getting used to a more matte finish, rather than glossy shiny lips. 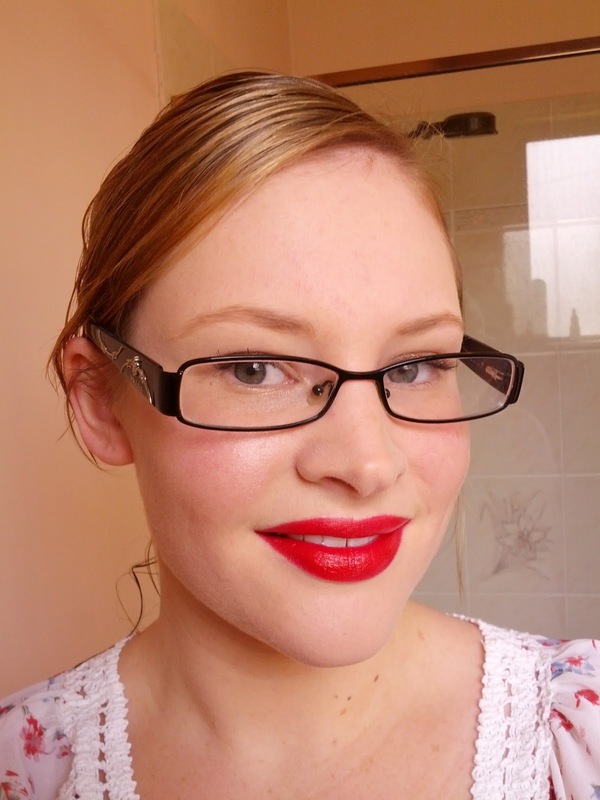 I like that the lipstick is quite moisturising (even though it feels drier than what I'm used to). One thing you'll see from the picture is that sometimes it looks bright red, while at other angles (and in different lighting) it's more of a pinky red. Every room in my house made it a different colour. What I loved about the colour (especially when it looked more red) was it really makes your teeth look super white. I found that it lasted for about 4 hours before it started to fade. You'll need to reapply after eating. Overall I was really pleased with this. For only $15 (I paid $5 after using the voucher) it was a great bargain lipstick. I'm looking at buying "Spellbound" which is a gorgeous bright pink. Have you used your CoverGirl voucher yet? That colour looks great on you. 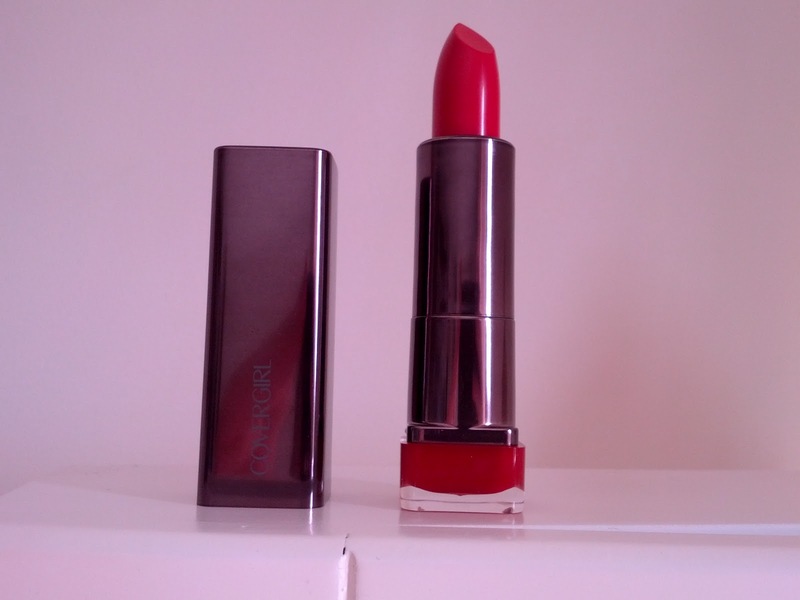 I used my voucher today and got the shade 'Kiss' which is a pale coral colour. Amazingly Priceline had 30% off all Covergirl products today too so it only ended up costing me $0.46 after my $10 off. Who could resist that?? It seems to be a lovely creamy lipstick though. Wow! What a great bargain!! I'm loving corals at the moment too! It looks really nice on you! As you know my voucher didn't go to anything as exciting! Sheri, get the lipsticks!!! They are amazing. 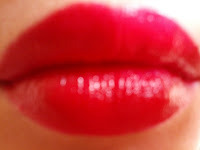 I also love applying it with my finger for more a lip stain look. I love those lip sticks. I have spellbound and I love it! Mine stained my lips, does yours do the same? I just bought Spellbound yesterday and can't wait to wear it!! It does stain my lips, but I love that look. I normally apply a lip balm first to stop it staining badly. Thanks hun! :) Your so sweet! Those red lips look fabulous on you! I used my voucher yesterday too, what a coincidence! I got a shadow palette completely free, as it was down to about $9 due to the 30% off! I posted a picture on my blog! It looks awesome on you! I have a very similar relationship with red lips - I am forever buying new shaded but it really takes confidence to putt them off! I used my voucher for one of these as well and paid 46c as they had 30% off and then the $10 voucher still worked on top of that, best bargain ever! Thanks hun! It really does take confidence to pull it off. I'm fine at home alone, but being out makes me think "ohh gosh my lips are too bright." Thanks hun, use it while they have the sale on, since a lot of girls have said they got the 30% off as well as the $10 voucher. I want to try the eye shadows too! Thanks hun! Scarlett does an amazing red lip, especially when she is blonde. This shade looks amazing on you!! I love CoverGirl Lip Perfection lippies, but haven't tried this shade! Thanks hun. I'm so impressed with their Lippies. Such great quality for their price.